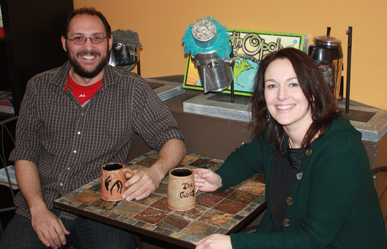 Our purpose at The Goat Coffee House is to provide a quality cafe experience. We use the highest quality custom hand roasted beans. Our beans are organic fair trade and locally roasted in Duluth, MN. You can visit their web site at www.alakef.com. Using products that are better for the environment is also important to us. We use compostable cups, soup containers, dinnerwear and have many healthy food options. Most importantly however, is that our customers love their experience at The Goat! Ryan - Ryan grew up in Eau Claire and the rest is a mystery. You'll just have to come and get to know him. Laura- Laura grew up in New Auburn and graduated from UWEC. Things that make her happy: her kids, owning this little shop and coffee! !